The Fall 2018 Colloquium will take place every Wednesday from 4:30 to 5:30 at CMSA, 20 Garden Street, Room G10. This year’s colloquium will be organized by Jörn Boehnke, Sergiy Verstyuk and Aghil Khangha. The schedule below will be updated as speakers are confirmed. Abstract: In this talk, I will review the recent progress on classification of gapped phases of quantum matter (ie topological orders) in 1,2, and 3 spatial dimensions for boson systems. In 1-dimension, there is no non-trivial topological orders. In 2-dimensions, the topological orders are classified by modular tensor category theory. In 3-dimensions, the topological orders are classified by a simple class of braided fusion 2-categories. The classification of topological orders may correspond to a classification of fully extended unitary TQFTs. Abstract: This will be a general talk concerning the role that the scalar curvature plays in Riemannian geometry and general relativity. We will describe recent work on extending the known results to all dimensions, and other issues which are being actively studied. Abstract: Correspondence problems involving matching of two or more geometric domains find application across disciplines, from machine learning to computer vision. A basic theoretical framework involving correspondence along geometric domains is optimal transport (OT). Dating back to early economic applications, the OT problem has received renewed interest thanks to its applicability to problems in machine learning, computer graphics, geometry, and other disciplines. The main barrier to wide adoption of OT as a modeling tool is the expense of optimization in OT problems. 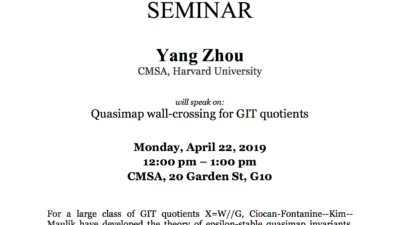 In this talk, I will summarize efforts in my group to make large-scale transport tractable over a variety of domains and in a variety of application scenarios, helping transition OT from theory to practice. 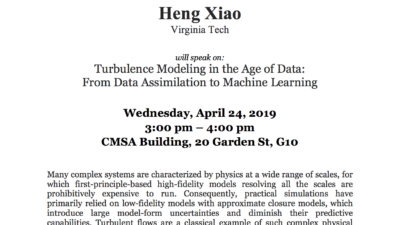 In addition, I will show how OT can be used as a unit in algorithms for solving a variety of problems involving the processing of geometrically-structured data. Abstract: There are certain, specific behaviors that are particularly distinctive of life. For example, living things self-replicate, harvest energy from challenging environmental sources, and translate experiences of past and present into actions that accurately anticipate the predictable parts of their future. What all of these activities have in common from a physics standpoint is that they generally take place under conditions where the pronounced flow of heat sharpens the arrow of time. We have therefore sought to use thermodynamics to understand the emergence and persistence of life-like phenomena in a wide range of messy systems made of many interacting components. 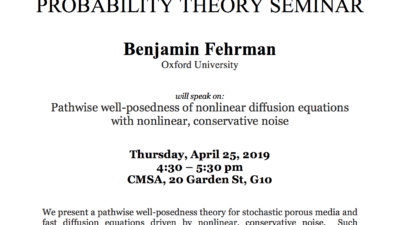 In this talk I will discuss some of the recent insights we have gleaned from studying emergent fine-tuning in disordered collections of matter exposed to complexly patterned environments. I will also point towards future possible applications in the design of new, more life-like ways of computing that have the potential to either be cheaper or more powerful than existing means. Abstract: The problem of electoral redistricting can be set up as a search of the space of partitions of a graph (representing the units of a state or other jurisdiction) subject to constraints (state and federal rules about the properties of districts). I’ll survey the problem and some approaches to studying it, with an emphasis on the deep mathematical questions it raises, from combinatorial enumeration to discrete differential geometry to dynamics. Abstract: Essential to many constructions and applications of symplectic geometry is the ability to count J-holomorphic curves. The moduli spaces of such curves have well understood compactifications, and if cut out transversally are oriented manifolds of dimension equal to the index of the problem, so that they a fundamental class that can be used to count curves. In the general case, when the defining equation is not transverse, there are various different approaches to constructing a representative for this class, We will discuss and compare different approaches to such a construction e.g. using polyfolds or various kinds of finite dimensional reduction. Most of this is joint work with Katrin Wehrheim. Abstract: Auditory cortex is located at the top of a hierarchical processing pathway in the brain that encodes acoustic information. This brain region is crucial for speech and music perception and vocal production. Auditory cortex has long been considered a difficult brain region to study and remained one of less understood sensory cortices. Studies have shown that neural computation in auditory cortex is highly nonlinear. In contrast to other sensory systems, the auditory system has a longer pathway between sensory receptors and the cerebral cortex. This unique organization reflects the needs of the auditory system to process time-varying and spectrally overlapping acoustic signals entering the ears from all spatial directions at any given time. Unlike visual or somatosensory cortices, auditory cortex must also process and differentiate sounds that are externally generated or self-produced (during speaking). Neural representations of acoustic information in auditory cortex are shaped by auditory feedback and vocal control signals during speaking. Our laboratory has developed a unique and highly vocal non-human primate model (the common marmoset) and quantitative tools to study neural mechanisms underlying audition and vocal communication. Abstract: A family of surfaces moves by mean curvature flow if the velocity at each point is given by the mean curvature vector. Mean curvature flow is the most natural evolution in extrinsic geometry and shares many features with Hamilton’s Ricci flow from intrinsic geometry. In the first half of the talk, I will give an overview of the well developed theory in the mean convex case, i.e. when the mean curvature vector everywhere on the surface points inwards. Mean convex mean curvature flow can be continued through all singularities either via surgery or as level set solution, with a precise structure theory for the singular set. In the second half of the talk, I will report on recent progress in the general case without any curvature assumptions. Namely, I will describe our solution of the mean convex neighborhood conjecture and the nonfattening conjecture, as well as a general classification result for all possible blowup limits near spherical or cylindrical singularities. In particular, assuming Ilmanen’s multiplicity one conjecture, we conclude that for embedded two-spheres the mean curvature flow through singularities is well-posed. This is joint work with Kyeongsu Choi and Or Hershkovits. Abstract: Einstein’s theory of gravity is based on assuming that the fluxes of a energy and momentum in a physical system are proportional to a certain variant of the Ricci curvature tensor on a smooth 3+1 dimensional spacetime. The fact that gravity is attractive rather than repulsive is encoded in the positivity properties which this tensor is assumed to satisfy. Hawking and Penrose (1971) used this positivity of energy to give conditions under which smooth spacetimes must develop singularities. By lifting fractional powers of the Lorentz distance between points on a globally hyperbolic spacetime to probability measures on spacetime events, we show that the strong energy condition of Hawking and Penrose is equivalent to convexity of the Boltzmann-Shannon entropy along the resulting geodesics of probability measures. This new characterization of the strong energy condition on globally hyperbolic manifolds also makes sense in (non-smooth) metric measure settings, where it has the potential to provide a framework for developing a theory of gravity which admits certain singularities and can be continued beyond them. It provides a Lorentzian analog of Lott, Villani and Sturm’s metric-measure theory of lower Ricci bounds, and hints at new connections linking gravity to the second law of thermodynamics. Abstract: This talk is of expository nature. Drinfeld introduced the notion of Shtukas and the moduli space of them. I will review how Shtukas compare to more familiar objects in geometry, how they are used in the Langlands program, and what remains to be done about them. 1/30/2019 Richard Freeman (Harvard) Title: Innovation in Cell Phones in the US and China: Who Improves Technology Faster? Abstract: Cell phones are the archetypical modern consumer innovation, spreading around the world at an incredible pace, extensively used for connecting people with the Internet and diverse apps. Consumers report spending from 2-5 hours a day at their cell phones, with 44% of Americans saying “couldn’t go a day without their mobile devices.” Cell phone manufacturers introduce new models regularly, embodying additional features while other firms produce new applications that increase demand for the phones. Using newly developed data on the prices, attributes, and sales of different models in the US and China, this paper estimates the magnitude of technological change in the phones in the 2000s. It explores the problems of analyzing a product with many interactive attributes in the standard hedonic price regression model and uses Principal Components Regression to reduce dimensionality. The main finding is that technology improved the value of cell phones at comparable rates in the US and China, despite different market structures and different evaluations of some attributes and brands. The study concludes with a discussion of ways to evaluate the economic surplus created by the cell phones and their contribution to economic well-being. Abstract: Consider inference about the mean of a population with finite variance, based on an i.i.d. sample. The usual t-statistic yields correct inference in large samples, but heavy tails induce poor small sample behavior. This paper combines extreme value theory for the smallest and largest observations with a normal approximation for the t-statistic of a truncated sample to obtain more accurate inference. This alternative approximation is shown to provide a refinement over the standard normal approximation to the full sample t-statistic under more than two but less than three moments, while the bootstrap does not. Small sample simulations suggest substantial size improvements over the bootstrap. Abstract: 4D printing is the name given to a set of advanced manufacturing techniques for designing flat materials that, upon application of a stimulus, fold and deform into a target three-dimensional shapes. The successful design of such structures requires an understanding of geometry as it applies to the mechanics of thin, elastic sheets. Thus, 4D printing provides a playground for both the development of new theoretical tools as well as old tools applied to new problems and experimental challenges in soft materials. I will describe our group’s efforts to understand and design structures that can fold from an initially flat sheet to target three-dimensional shapes. After reviewing the state-of-the-art in the theory of 4D printing, I will describe recent results on the folding and misfolding of flat structures and highlight the challenges remaining to be overcome. Abstract: We propose a model of optimal decision making subject to a memory constraint. The constraint is a limit on the complexity of memory measured using Shannon’s mutual information, as in models of rational inattention; the structure of the imprecise memory is optimized (for a given decision problem and noisy environment) subject to this constraint. We characterize the form of the optimally imprecise memory, and show that the model implies that both forecasts and actions will exhibit idiosyncratic random variation; that beliefs will fluctuate forever around the rational-expectations (perfect-memory) beliefs with a variance that does not fall to zero; and that more recent news will be given disproportionate weight. The model provides a simple explanation for a number of features of observed forecast bias in laboratory and field settings. Abstract: A theme of long standing interest (to the speaker!) concerns the relationship between the topology of spacetime and the occurrence of singularities (causal geodesic incompleteness). Many results concerning this center around the notion of topological censorship, which has to do with the idea that the region outside all black holes (and white holes) should be simple. The aim of the results to be presented is to provide support for topological censorship at the pure initial data level, thereby circumventing difficult issues of global evolution. The proofs rely on the recently developed theory of marginally outer trapped surfaces, which are natural spacetime analogues of minimal surfaces in Riemannian geometry. The talk will begin with a brief overview of general relativity and topological censorship. The talk is based primarily on joint work with various collaborators: Lars Andersson, Mattias Dahl, Michael Eichmair and Dan Pollack. 5:15pm Tatyana Sharpee (Salk Institute for Biological Studies) Title: Hyperbolic geometry of the olfactory space. Abstract: The sense of smell can be used to avoid poisons or estimate a food’s nutrition content because biochemical reactions create many by-products. Thus, the presence of certain bacteria in the food becomes associated with the emission of certain volatile compounds. This perspective suggests that it would be convenient for the nervous system encode odors based on statistics of their co-occurrence within natural mixtures rather than based on the chemical structure per se. I will discuss how this statistical perspective makes it possible to map odors to points in a hyperbolic space. Hyperbolic coordinates have a long but often underappreciated history of relevance to biology. For example, these coordinates approximate distance between species computed along dendograms, and more generally between points within hierarchical tree-like networks. We find that these coordinates, which were generated purely based on the statistics of odors in the natural environment, provide a contiguous map of human odor pleasantness. Further, a separate analysis of human perceptual descriptions of smells indicates that these also generate a three dimensional hyperbolic representation of odors. This match in geometries between natural odor statistics and human perception can help to minimize distortions that would otherwise arise when mapping odors to perception. We identify three axes in the perceptual space that are aligned with odor pleasantness, its molecular boiling point and acidity. Because the perceptual space is curved, one can predict odor pleasantness by knowing the coordinates along the molecular boiling point and acidity axes. Abstract: This paper examines the merits of state control versus private provision of spirits retail, using the 2012 deregulation of liquor sales in Washington state as an event study. We document effects along a number of dimensions: prices, product variety, convenience, substitution to other goods, state revenue, and consumption externalities. We estimate a demand system to evaluate the net effect of privatization on consumer welfare. Our findings suggest that deregulation harmed the median Washingtonian, even though residents voted in favor of deregulation by a 16% margin. Further, we find that vote shares for the deregulation initiative do not reflect welfare gains at the ZIP code level. We discuss implications of our findings for the efficacy of direct democracy as a policy tool. Abstract: Motivated by the recent rise of populism in western democracies, we develop a model in which a populist backlash emerges endogenously in a growing economy. In the model, voters dislike inequality, especially the high consumption of “elites.” Economic growth exacerbates inequality due to heterogeneity in risk aversion. In response to rising inequality, rich-country voters optimally elect a populist promising to end globalization. Countries with more inequality, higher financial development, and current account deficits are more vulnerable to populism, both in the model and in the data. Evidence on who voted for Brexit and Trump in 2016 also supports the model. Abstract: Inspired by the “third wave” of artificial intelligence (AI), machine learning has found rapid applications in various topics of physics research. Perhaps one of the most ambitious goals of machine learning physics is to develop novel approaches that ultimately allows AI to discover new concepts and governing equations of physics from experimental observations. In this talk, I will present our progress in applying machine learning technique to reveal the quantum wave function of Bose-Einstein condensate (BEC) and the holographic geometry of conformal field theories. In the first part, we apply machine translation to learn the mapping between potential and density profiles of BEC and show how the concept of quantum wave function can emerge in the latent space of the translator and how the Schrodinger equation is formulated as a recurrent neural network. In the second part, we design a generative model to learn the field theory configuration of the XY model and show how the machine can identify the holographic bulk degrees of freedom and use them to probe the emergent holographic geometry.